The sad increase in interracial violence in recent months has proven the old adage, “He who forgets the past is doomed to repeat it.” So taking that into consideration, at what age do we begin to teach our young about that past? When my daughter was a child she asked me if any of our ancestors had ever owned slaves. I told her no. That’s what I believed. As I began to enjoy genealogy as a hobby, I learned differently. I discovered the wills of my ancestors archived online. Slaves were bequeathed to family members along with household furniture. A child of a slave was given to a separate household. I literally felt sick to my stomach. How could my own flesh and blood treat human beings as if they did not have the same thoughts, feelings, and love of family as everyone else simply because of the color of their skin? It was two full years before I could bring myself to tell my daughter the truth about our family and slavery. There also came a day when she came home from school telling me that one of her favorite teachers, originally from a country with a history of discrimination against minorities, had told the class that slavery really wasn’t that bad. Much discussion followed. The 2013 movie “12 Years A Slave” reintroduced the concept of free men who were kidnapped and sold into slavery which is something most Americans have probably not studied since high school. Though a great movie for adults, it was perhaps a bit harsh for children. Today, there is a kindle book that I wish had been available when my daughter asked me questions about slavery in America. Edited for an 8-12 year old reading level, this version leaves out the more grisly and less age-appropriate details but doesn’t shy away from the fear and sadness that Northup saw and faced. 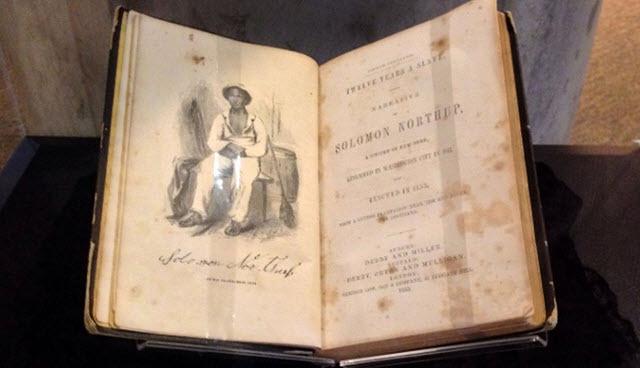 Solomon Northup, who was mixed raced, was born a free man in New York. He eventually married Anne Hampton who was also mixed race. Together they had three children who were also free. Solomon held different jobs but became known as a fiddle player. When Solomon was 32, he met two men who appeared to be offering him a dream job. He could travel, play his fiddle, and earn money. At first, things seemed fine. But then the men drugged him, took his papers showing that he was a free man, and sold him as a runaway slave. This was the beginning of Northup’s 12 year nightmare. He missed his family terribly. All his attempts to send messages to his family or convince anyone that he was free met with failure. His name was changed to make it harder for anyone looking for him to find out what had happened to him. Northup endured the horrors of slavery. He saw families torn apart at the auction block. He was sold from place to place. Some masters were good and some were bad, but nothing made him give up his quest to reunite with his family. With younger children, I would recommend reading the book together. For older children, you might still wish to read the book ahead of time just to be ready to answer questions. It is not just the responsibility of the black parent, the white parent, or the school system to teach our children of what has happened in the past. It’s the responsibility of everyone who wants to make sure that the strides toward equality continue. When you make the world a better place for one part of society, you automatically make the world a better place for all society.